We have been actively working on yet another view for Plastic. This is an old one, the branch diagram, capable of showing a global view of the status of the development. Well, in Plastic, there is an important difference with traditional tools like cvs, subversion or perforce. We don't copy (of soft copy) all elements in every new branch. In contrast, we provide a mechanism called branch inheritance. Here, a new branch does not contain anything until a revision is created on it, the rest of the items being inherited from the parent branch. This gives numerous advantages over traditional "soft copy" model, being able to use hierarchies for managing development complexities, and then promoting changes as they go through the different development stages. So our 3D version tree displays the history of a single item, which won't normally be present on all branches, only on those where it was modified. 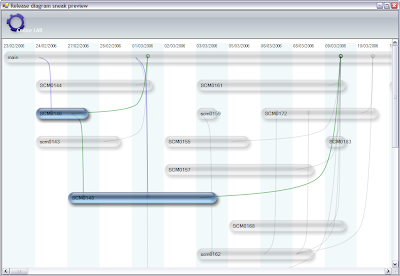 On the other hand, the new branch - release diagram displays all branches and their relations, for instance, when items have been merged (or promoted) from task branches to mainline. 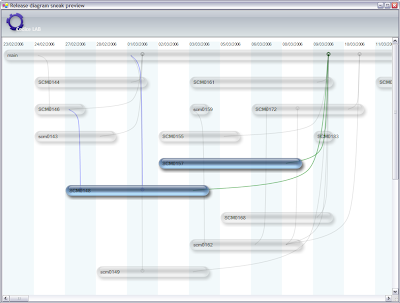 In these screenshots (using aqua style on windows :-P) we are showing a branch per task pattern (we have around 1500 branches in our repository at this moment), as well as rebases and merges. 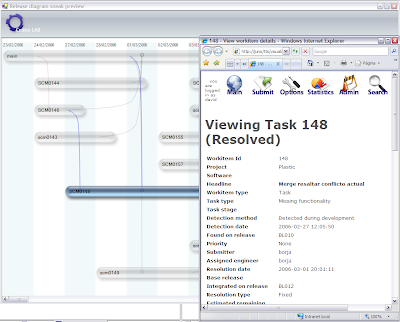 You can even use the new integration with task-management tools. Here in the shot, you can see the integration with our internal task control tool (TTS) which I already talked about in another post. 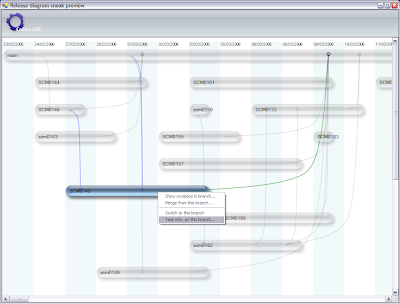 This integration is also working with other tools like OnTime, versionOne or Jira. I guess it's easy to implement and could be a really good usability aid!